WEAVING TOGETHER INSPIRATIONAL THEMES, PHILOSOPHY, AND CREATIVE SEQUENCING. Click Sign Up to go to the current schedule, and check out the Teachers & Staff page for more about our teachers and their styles. A beginner class with more basic poses and supportive cues. Slower-paced movement builds alignment, breath, and flow. An intermediate-advanced flow class with stronger postures. Increases flexibility, strength, and stamina. A mindful alignment-based practice, moving at a slower pace to focus on core body awareness and transitions. Mindful postures, stretching, and restorative poses to develop flexibility, strength, and balance. Perfect for those who want to unwind or have physical concerns or injuries. Restorative yoga poses are held longer and use props for support and to encourage relaxation. Yin yoga is a slow paced style of yoga where poses are held for longer periods of time, up to several minutes. Most yin poses are passive and involve a variety of seated and supine shapes. 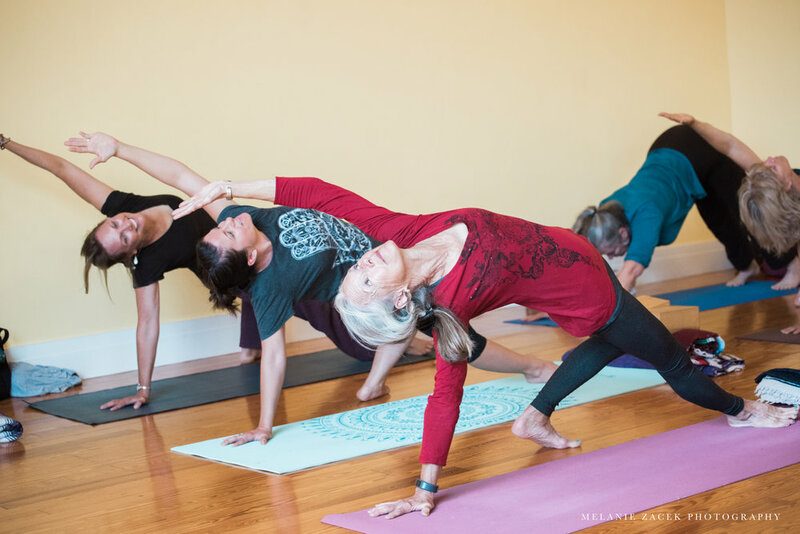 Gravity and the breath is used to soften the body and move deeper into the poses and the subtle layers of the body. Each week a different YS teacher will lead this mixed level class. Check the online schedule here to see who is teaching each week. A pay what you can donation class. 1/3 of the donation supports a local or national charity or cause each month. All levels welcome. *this is a donation class. Memberships, class pass, and drop pricing not applicable. Please bring exact change for the amount you with to donate as there will not be change available. Checks welcome. Perhaps you'd like to try yoga for the first time in an individual class, or you might have a specific issue you want to address. Either way, a private lesson is the perfect way to meet your own personal needs. You can come once for a tune-up or a home practice sequence, check in every few weeks or months, or sign up for ongoing private sessions. Give yourself the gift of your teacher's undivided attention, and receive the support you need to align your body and experience the changes, growth and transformation you are looking for. In case of inclement weather, we will post cancellations to our schedule one hour before class. Otherwise, we’ll see you in the studio!